Re-reading the Fantastic Four comics from the start. But wait, this isn’t an FF comic, it’s Avengers #233. Fantastic Four was popular enough at the time that the Negative Zone tale took over Avengers for one issue. While the FF are in the Negative Zone, Annihilus came to Earth and took over the Baxter Building, erecting a giant invisible barrier around part of New York. 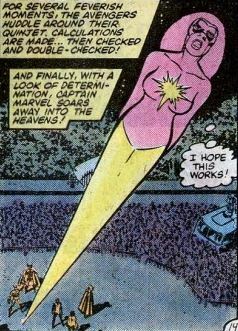 We begin with Captain Marvel — this is the light-powered Monica Rambeau version of Captain Marvel — flying over the city. She runs right into the barrier, and is not able to make it visible despite blasting it with light. She transforms herself into radio waves, cosmic rays, and gamma rays, none of which have any effect on the barrier. She flies to Avengers Mansion to get the team together. 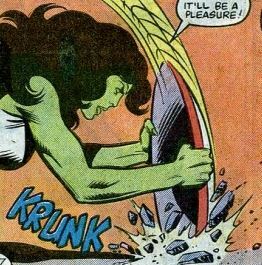 At the barrier, She-Hulk discovered it is expanding, even as she uses her awesome strength against it. The rest of the team joins her. We got the Wasp, Captain America, Captain Marvel, Thor, and a guy named Starfox. 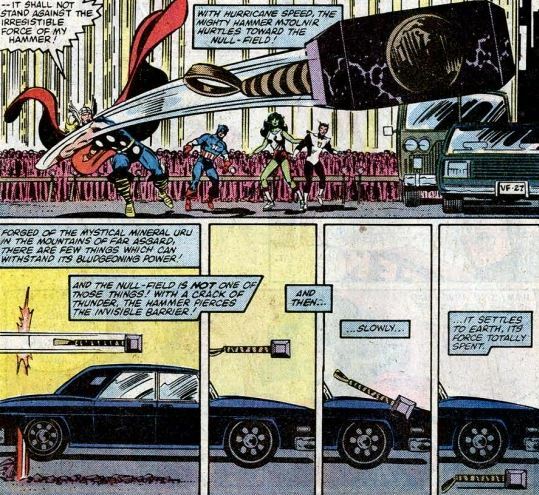 She-Hulk uses Cap’s shield to determine that the barrier is under the street as well. Thor throws his hammer at the barrier, saying he is using “the full unfettered might of the lightning at my command.” The hammer succeeds in breaking through the barrier, which seals up behind it. Now separated from his hammer, Thor has to run off before transforming back into plain ol’ Dr. Donald Blake. Captain America is the only Avenger present that knows Thor’s secret identity, and promises to make an excuse to him leaving. While the rest of the Avengers huddle and try to make a plan, Starfox sees a beautiful woman watching them. See, in addition to flight and super-strength, Starfox also has the incredibly creepy power of being able to make any woman fall in love with him, so he does that right now. An Avengers Quinjet lands at the scene, and the Vision and the Scarlet Witch step out. 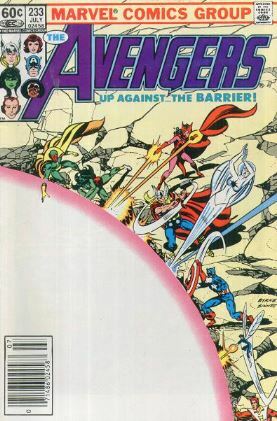 The Vision tries to use his walk-through-walls power to enter the barrier. It looks like it works at first, but then the Vision collapses, as if all his android parts merely shut off. Scarlet Witch uses her hex fields against the barrier, but no luck. Starfox continues to creep on the hypnotized woman, when he sees a strange light come from the Baxter Building. Based on this, he deduces that the two universes are merging, threatening to destroy them both. Starfox comes up with a plan to use Captain Marvel’s powers against the barrier. From the Baxter Building, Annihilus broadcasts a message to all New York, saying all will perish alongside him. Captain Marvel flies into space, traveling at her fastest speed, all the way to the sun. She absorbs vast amounts of gamma ray energy from the sun, and then blasts back to Earth, transforming herself into a gamma laser. She breaks through the barrier, which causes all kinds of crazy lights to go off around the Baxter Building. With that, the barrier disappears. Fantastic fifth wheel: She-Hulk is flirty with Starfox at first, but later threatens to beat him up (!) when he suggests that the Earth might be doomed. They apparently settle their differences, because in the next issue it’s strongly hinted that they’d had a one-night stand. Super soldier: Captain America might have revealed his secret identity to Bernie Rosenthal, but doesn’t want to discuss superhero matters with her. Cap is really broken up about Iron Man quitting the team, as he mentions it several times. God of Thunder: At one point, Thor thinks to himself, “Dr. Blake will miss his flight back to Chicago this day.” Dude, you can fly! Why are you bothering with all the hassles of the airport? Dammit Janet: The Wasp was team leader of the Avengers during this time, and we see a couple of panels with her coordinating with the NYPD to keep the streets cleared of civilians during the action. Photonic: This is actually Captain Marvel’s first day on the job as an Avenger. Except that she joined the team back in issue #227. She reveals that the events of last seven Avengers issues — including battling the Masters of Evil, rescuing the U.S. President, Jocasta’s funeral, Iron Man quitting the team, and the fight with Plant-Man — all took place on the same day as this issue. Trivia time: So, how did the FF story bleed over into Avengers like this? This issue was co-written and penciled by FF writer-artist John Byrne. In that sense, it’s kind of like an Avengers fill-in issue. The issue after this one deals with the Vision recovering from his injury, with extended flashbacks about his and Scarlet Witch’s history. Hawkeye was also a member of the Avengers team during this time, but was out of action due to a broken leg. Fantastic or frightful? 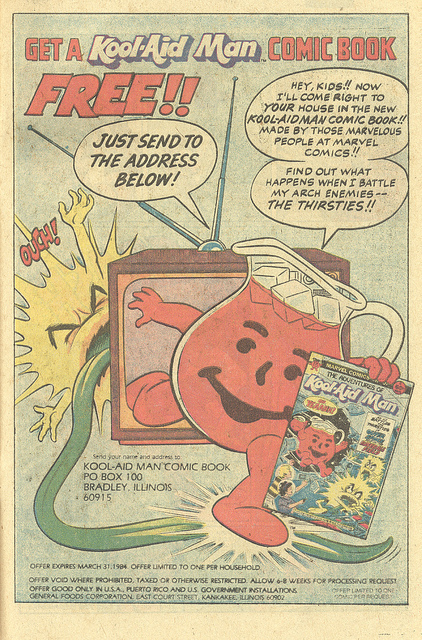 This was just before comics went total crossover-happy, so two books combining a plotline was still quite the novelty. Still, the Avengers part of the story is still mostly on the periphery. This is a fun issue, but low on substance. Next week: We all fall down.